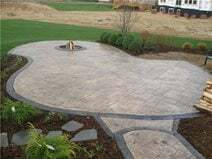 If your backyard (or budget) allows for installation of only a small concrete patio, you can still make a big impact by taking advantage of concrete's ability to be cast in nearly any shape, pattern, or color. Consider these decorative options to give your small patio greater visual appeal and functionality. You don't have to settle for boring square shapes with straight lines. "There's a trend for curved patios that blend with the landscaping," says Matt Zook of J&H Decorative Concrete. He likes to shape concrete patios so they flow with the landscaping. 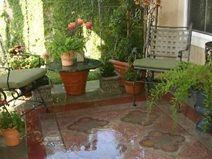 His patios typically only "square off" when they meet up with a walkway or doorway. Add a pattern or stenciled design. 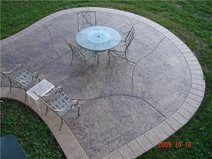 You can give your small patio the look of natural stone or brick by using a stamped pattern or stencils. With stencils, you can also create more elaborate custom designs, such as a faux outdoor area rug. Zook likes to frame small patios with a border, especially if the patio has a pattern. "It looks cleaner," he says. "I don't like the look of a pattern running all the way off the edge." Borders also are an effective, inexpensive way to dress up plain concrete, if economy is an issue. 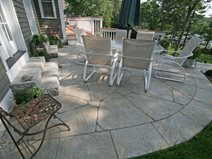 Other easy-on-the-budget finishes for small patios include exposed aggregate and a rock salt finish (see Three Budget-Friendly Decorative Finishes for Exterior Concrete). You can achieve a wide array of great decorative effects using integral or topically applied color. For a small patio, however, it's best to keep it simple. "The price goes up with more choices of color," says Zook. "It can be more economical to use the same color for patterned fields and borders." He also recommends choosing colors that match or complement the house. For more ideas and design tips, see Colored Concrete. Allow enough space for outdoor furniture. Zook recommends a minimum patio size of 20 to 25 square feet to accommodate furniture and space for walking. He tells customers that for a six-chair outdoor table, they will need at least 10 feet of circumference for the table, plus additional walk-around room. Here are more patio sizing tips from landscape designer Scott Cohen of The Green Scene.